The economic downturn of the early 1980s resulted in numerous BR locomotives being put into store, especially older types such as Class 31s. 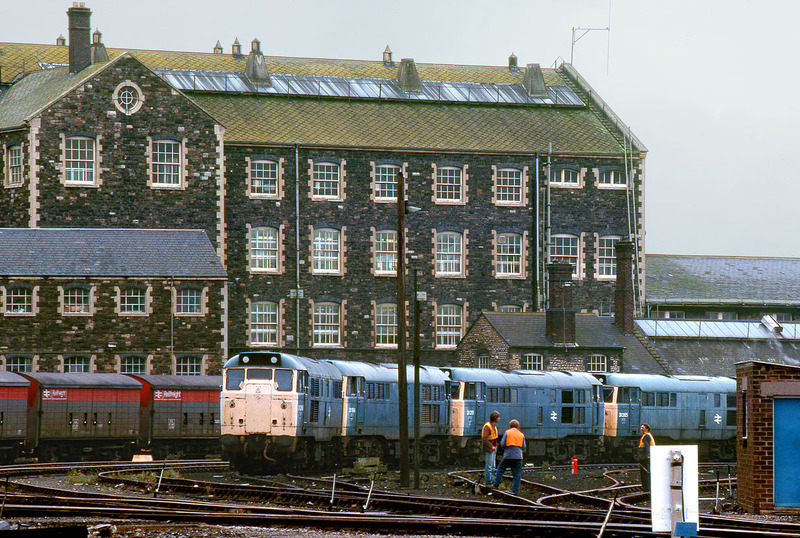 On 25 October 1982, a line of stored 31s is pictured in front of Swindon Works. At the front is 31269, with an extremely faded, almost white front end. Behind it are: 31194, 31211 & 31265. Although it seemed at the time that the end was imminent for these locos, that was far from the case, as they were all overhauled and fitted with ETH. 31269 became 31429, 31194 became 31427, 31211 became 31428 & 31265 became 31430 (and later 31530). Some printed sources suggest that at least two of these locos left Swindon for Doncaster on 19 October. They clearly didn't! Of note is the fact that there is no sign of any movement in the track workers, despite the ¼sec exposure required for this 200mm lens view.